Apple pie in a flaky crust. Lots of spices and good hot or cold! Preheat oven to 425F degrees. Fill your unbaked pastry with the sliced and peeled apples. Combine sugar, cinnamon, nutmeg, and salt. Sprinkle on top of apples. Dot with butter. Place top of pastry over the filling and flute edges. Sprinkle top with 1 tsp sugar or milk brushed on top. Bake at 425 degrees for 50-60 minutes or until golden brown and apples are tender. ENJOY! In a small bowl, beat water, eggs and vinegar together. Stir liquid mixture into flour mixture. Gather dough into a large ball and chill. Pinch off half the dough to form a crust. Roll out to fit the pan. If you need a baked pie shell, bake in a 425F preheated oven for 10-12 minutes. Prefer a little more spice in your apple pie? Try this one. Combine apples, granulated sugar, flour, lemon juice and zest, and spices in a large bowl. Toss well. Pour apple mixture into deep dish pie crust, piling high into a domed shape and scraping all juices into pie. Dot with butter. Stretch the top crust to make sure it covers the filling completely. Pinch the top and bottom crust together all around the edges. Make 4 small steam vents in the top. Brush the beaten egg on the top crust and sprinkle with raw sugar. Place pie on a cookie sheet (it will drip a little). Bake for 1 hour. 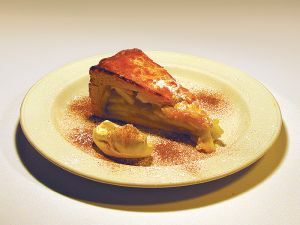 If you liked this apple pie, then check out these recipes.